These Commission Summaries are intended to provide highlights of the First 5 LA Board of Commissioners’ actions to advance the outcome areas of First 5 LA’s 2015–2020 Strategic Plan. Highlights from the October 12 Commission meeting include approval of eight strategic partnerships to advance First 5 LA’s Kindergarten Readiness Assessment (KRA) Strategy; approval of the Comprehensive Annual Financial Report (CAFR) and a presentation on a potential strategic partnership with the Silicon Valley Community Foundation for gubernatorial candidate engagement. The Board of Commissioners meets on the second Thursday of each month at 1:30 p.m., unless otherwise indicated, at the First 5 LA offices. All meetings are open to the public, and agendas are posted on our website at least 72 hours in advance. Please check our Commission Calendar for all updated meeting information and click here for Commission meeting packets, agendas, summaries and meeting notes. In a significant step forward to advance First 5 LA’s Kindergarten Readiness Assessment (KRA) strategy, the Board approved eight strategic partnerships with a number of school districts and community anchor agencies to utilize the Early Developmental Instrument (EDI) data collection tool to provide insight into young children’s readiness for school and develop strategies for targeted improvements. Administered by kindergarten teachers three to six months after students enter their class, the EDI tool would assess 8,476 students through June 2020, providing insights and highlight population-wide vulnerabilities in five development domains: social competence, emotional maturity, language and cognitive skills, communication skills, and physical health and well-being. The three primary objectives of this KRA strategy are to 1) implement the EDI and collect data to assess the kindergarten readiness of children in the community; 2) strengthen the capacity of school districts and community agency staff to utilize the EDI to support policy and systems change; and 3) build the capacity of community stakeholders to understand the results of the EDI. In other action, the Board approved the Comprehensive Annual Financial Report (CAFR) for fiscal year ending June 30, 2017 — a clean audit for the sixth year in a row. Once again, the accomplishment earned First 5 LA the Certificate of Achievement for Excellence in Financial Reporting from the Government Finance Officers Association. 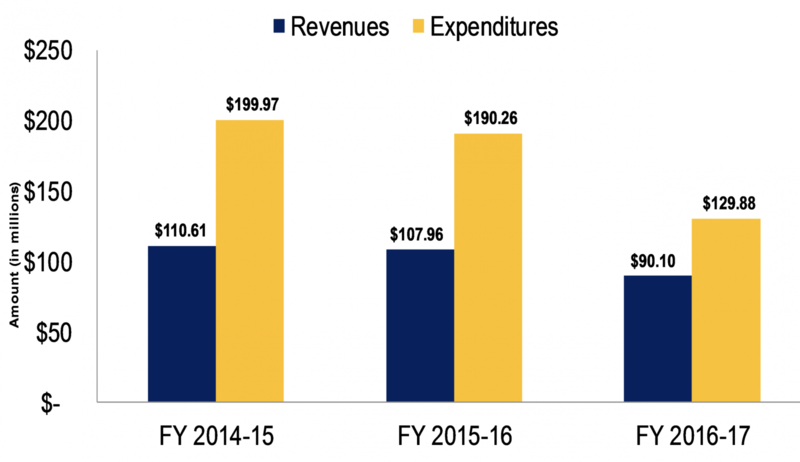 A draft copy of the CAFR can be found here, while this presentation from the meeting details a three-year comparison of revenues vs. expenditures, program and administrative costs, and the ending fiscal year fund balance. This data will be used to help update the agency’s Long Term Financial Projection in the future. The Commission also received a presentation on a proposal that will be put before the Board in November to establish a strategic partnership with the Silicon Valley Community Foundation to support (SVCF) to support SCVF’s “Choose Children Campaign” that seeks to ensure that the next governor of California is a champion for children. The presentation was helmed by First 5 LA Policy & Strategy Division Vice President Kim Pattillo Brownson, who noted that the $300,000 to be requested at the November Board meeting would go toward the following advocacy activities over a 24-month time frame: polling, policy development, deskside briefings and media engagement. These activities are legally permissible uses of First 5 LA’s resources. First 5 LA will not provide financial support for candidate debates or forums. The partnership presented an opportunity, Pattillo Brownson told the Board, to get “ahead of the curve” by elevating early childhood issues during the campaign among gubernatorial candidates before they are elected to office while also elevating Los Angeles County-specific needs and priorities that can be addressed by the incoming governor. As a funding partner, First 5 LA staff will play an advisory role in informing policy recommendations that are aligned with First 5 LA’s policy agenda inclusive of ECE, health and home visiting strategies. Pattillo Brownson was joined during the presentation by Avo Makdessian, VP and Director of the Center for Early Learning at SVCF, who told the Board that the $2.3 million has already been raised for the $3 million “Choose Children” campaign. He noted that the goal “is to make early childhood among the top three issues among candidates” for governor. In other Board news, Keesha Woods was appointed as a new Commission Alternate from the Los Angeles County Office of Education (LACOE). An early education leader with more than two decades of management and policy experience, Woods has served as executive director of LACOE Head Start and Early Learning Division since May 2011. Prior to joining LACOE in 1999, Woods served as a unit manager with the California Department of Social Services, State Licensing Office, for six years. Woods supervised program monitors and evaluators to ensure child care providers met or exceeded standards of service, helped to establish the first field monitoring system, and worked to bring consistency and increased knowledge for all Head Start grantees in L.A. County. Woods holds a master’s degree in public administration and a professional certification in leadership management. She is a California Head Start Association board member, a commissioner on the LA County Policy Roundtable and a fellow of the UCLA Leadership Institute.